Ever wonder what white-tailed deer see? Many times hunters overlook critical aspects such as deer vision, causing them to be ill-prepared and ineffective hunters. Additionally, the studies regarding deer vision in relation to deer hunting get mentioned in popular hunter culture but rarely is there a decent explanation citing facts and, more importantly, not related to some sort of consumer marketing. 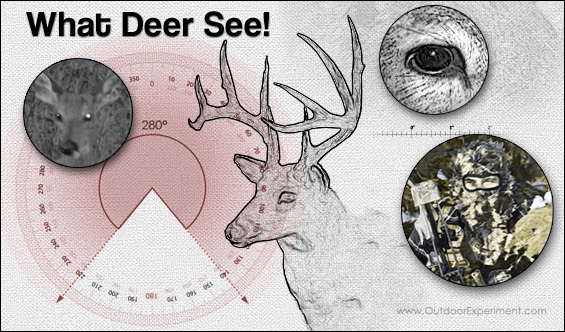 First, in order to understand deer vision, we need to start with the basics. The visible light spectrum consists of a frequency range approximately 380nm to 750nm. This frequency range can be broken up into smaller sections. These sections of light frequency appear differently to our eyes. Furthermore, there are different types of sensory cells in our eyes capable of perceiving different frequencies. As a result, we are able to differentiate these frequencies as multiple colors. The colors of the visible light spectrum are violet, blue, green, yellow, orange and red (Figure 1-A). Cone cells are responsible for color vision and are most effective in well lit conditions. Rod cells are more effective in low light conditions and, for the most part, don't allow for color vision. This is why discerning colors can be difficult when it gets dark, even if you can still see an object.